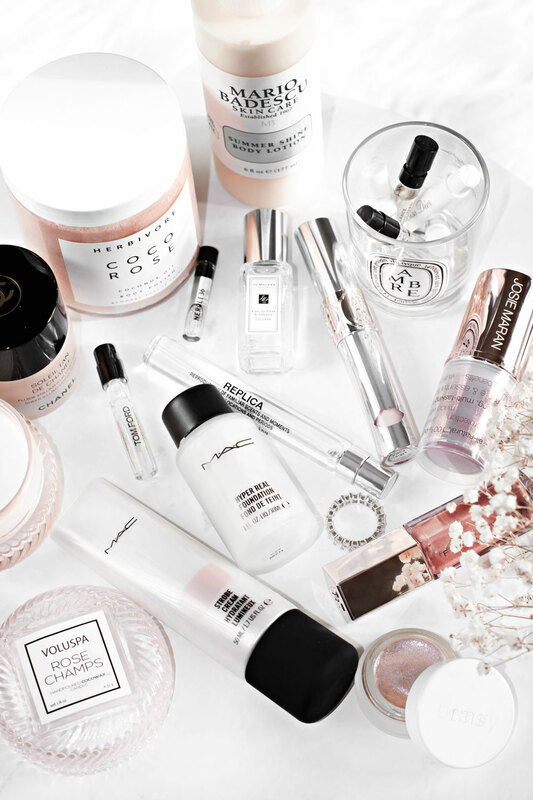 Ahh, that glow that us beauty and makeup lovers just looove to talk about. It’s a little harder to come by during winter, isn’t it? My skin notoriously hates cold temperatures and dry air and… well, winter altogether. I personally don’t mind it too much, but I gotta say that things often seem much more effortless and simple during warmer parts of the year. You spend more time out in the fresh air, you move more, you reach for fresh veggies more often and you drink a ton of water because it’s just “so hot today!” All of that combined makes that “glow” just a little easier to get. In winter, everything seems a bit more complicated. I mean, I literally have to use an app to remind myself to stay hydrated and drink water. I think that for me, at least, bringing some of that glow back into my life is not just about “looking pretty.” It’s also a form of self-care of sorts. Sometimes the weather just gets to me, and I kind of just want to bury myself in layers and layers of cozy loungewear and wool socks, hiding those pale legs of mine. All while also trying to ignore the fact that I find myself fantasizing about being able to just take off my itching skin and soak in a hypoallergenic fabric softener for a couple of hours. 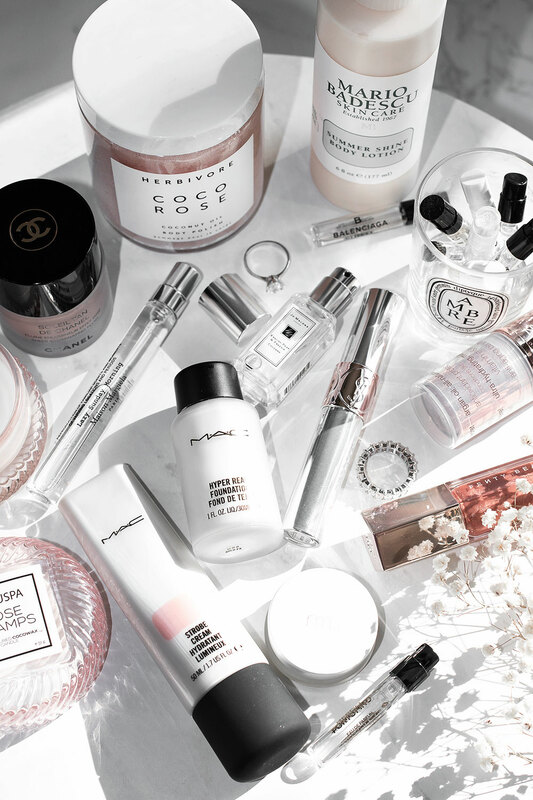 So, yes, getting some of that “winter glow” is not just about the looks. It’s also a way to keep yourself going through those cold, gloomy days. If your skin is anything like mine, then keeping it happy during winter takes a lot of effort. Other than regular dry-brushing and staying hydrated I also like to reach for a few body care products that make me look (and feel) a bit more alive. A nice DIY oat bath soak is often a heaven-sent for my dry and irritated skin. Amlactin is probably one of my most-used body care products, especially during winter- it works wonders for dry, flaky and itchy skin. Ceramides and lactic acid in this lotion help restore the skin and keep it soft, smooth and free of any dry patches. 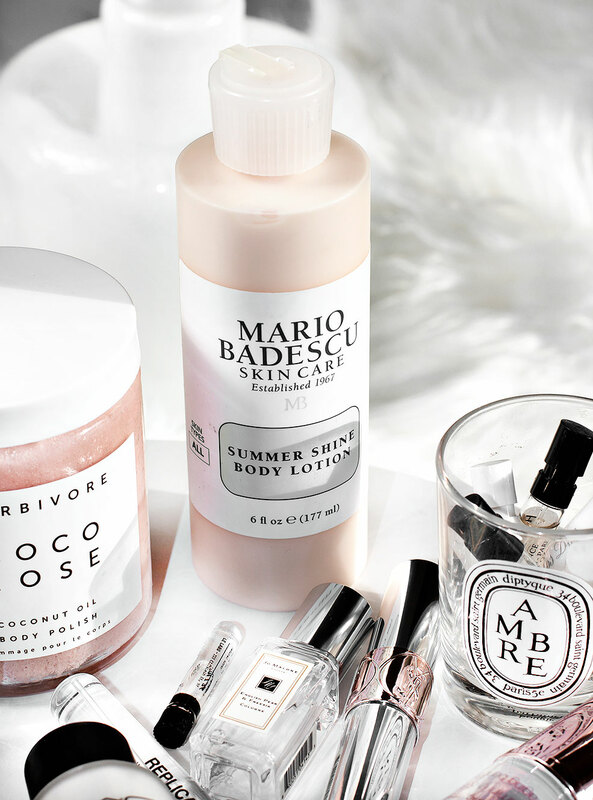 Mario Badescu’s Summer Shine Lotion adds a pretty, delicate sheen and has a lightweight formula that hydrates without feeling sticky. What’s the point, you might ask, if all that pretty glow is usually hidden under layers and layers of clothing during winter? Well, whenever I find myself missing those warmer days (or notice my legs slowly returning to their natural, nearly a see-through tone) my favorite self-tanning mousse and a little Summer Shine lotion do the trick. Not only does this combo remind me that summer will, indeed, come back once again, but it also acts like a little pick-me-up. Even though I very rarely spend time in the sun during summer, I love a little color and a nice glow- I just get both from those pretty bottles, jars, and tubes. I haven’t always been a fan of glossy lip products. They’ve always reminded me of those “rollerball” glosses we had in the 90s that smelled overly sweet and were so sticky that they’d get everywhere. Your hair, your hands, even your Sailor Moon pencil case, where you’d usually keep them. I mean, of course, at the time it was like the best thing ever and I even remember that my cousins, sister and I collected them. Well, lip gloss, like many things, has come a long way since then and I have a newfound love for them. In particular, Fenty Beauty Gloss Bomb Luminizer in Fenty Glow and YSL Volupté Liquid Color Balm in Night Rehab Lip Mask. Fenty Glow has such an amazing, hydrating and long-lasting formula that gives SO much glow and shine with a perfect hint of sparkle. YSL Volupté Liquid Color Balm feels just like a glossy lip balm with a high-shine finish and a sheer tint. Night Rehab shade is perfect for natural/no makeup days or can even be used as an overnight hydrating lip treatment. As much as I love my Salux, I also like a good body scrub. 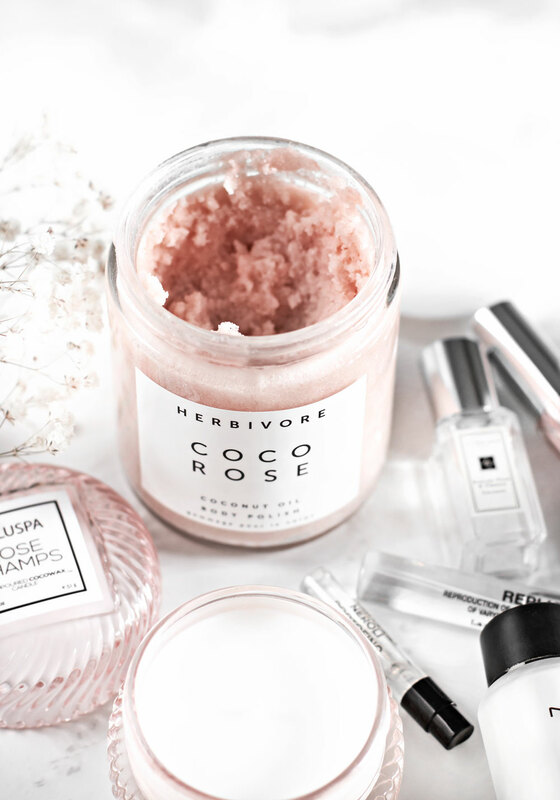 Herbivore’s Coco Rose Body Polish has a beautiful, uplifting scent and it’s lovely for some of that gentle exfoliation. Love that it’s formulated with coconut oil to also help hydrate the skin. I used to make my own coconut/rose body scrubs and in all honesty, they worked just as well, but it’s all about the convenience factors for me these days. How many times have I mentioned MAC’s Strobe Cream in the past? Too many to count, probably. It was, if I recall correctly, one of my first MAC products and it’s also one that I repurchase most frequently. I don’t just love the glow that it gives my skin- it’s actually a pretty well-formulated moisturizer and I use it even on my makeup-free days. The mineral pigments in this cream really help to make the skin look more radiant and it’s a great product for dry skin. Pixi’s Glowtion is another favorite in this department. The Hyper Real Foundation at first seems like a very similar product. First thing’s first: not sure why this is called “foundation” as it gives exactly zero coverage- it’s actually meant to be worn under or over foundation. 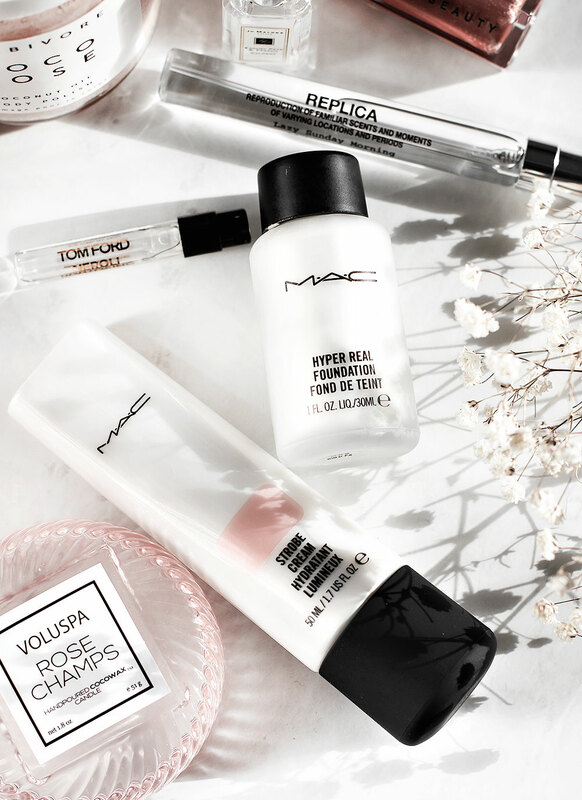 So, pretty much, a liquid highlighter. The main difference between this and the Strobe Cream is the finish. Hyper Real Foundation has more of a matte feel to it, it dries much quicker and it’s completely oil-free. Love using this under my foundation and I find that if I actually mix it with my foundation, it creates a really beautiful, long-lasting finish. Another product that I love using with or under my foundation is Chanel Soleil Tan De Chanel Sheer Illuminating Fluid. It might look a little intimidating for someone as pale as me, but it’s actually very sheer and delicate. It doesn’t matter if I use a self-tanner or not, my face always looks very pale when compared to my neck. Finding a foundation that actually matches my “winter” skin tone has always been a struggle, too. 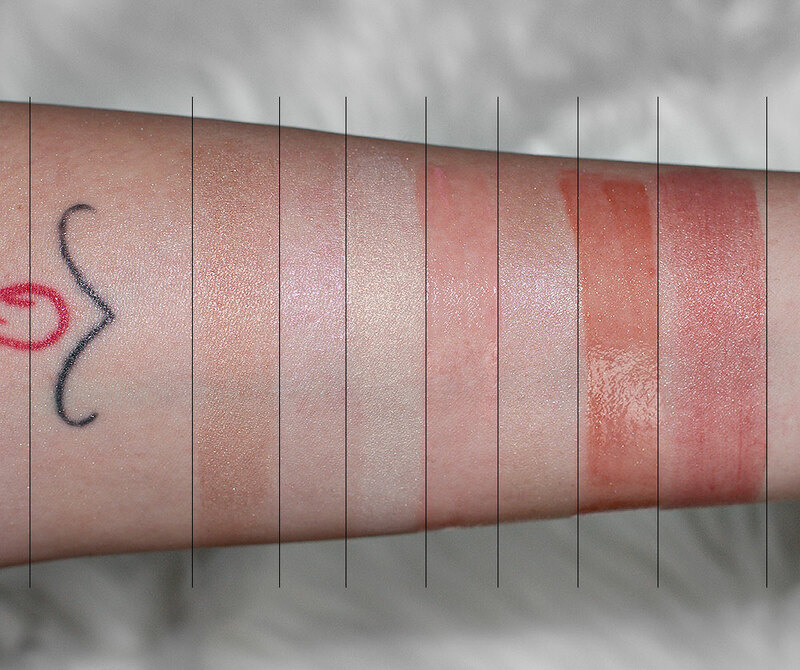 Most “light” shade selections have pink undertones or just make me look flat. As I’m not too crazy about the excessive use of bronzer or bronzing powders, this illuminating liquid is perfect for warming up my base juuust a little bit, while also adding a sheer glow. Nothing too crazy or in-your-face sparkly, but very subtle yet warm enough to add some dimension. Mario Badescu Summer Shine Body Lotion, Chanel Soleil Tan De Chanel Sheer Illuminating Fluid, MAC Strobe Cream, MAC Hyper Real Foundation in Gold FX, YSL Volupté Liquid Color Balm in Night Rehab Lip Mask, RMS Champagne Rosé Luminizer, Fenty Beauty Gloss Bomb Luminizer in Fenty Glow, Josie Maran Argan Oil Color Stick in Rosey.